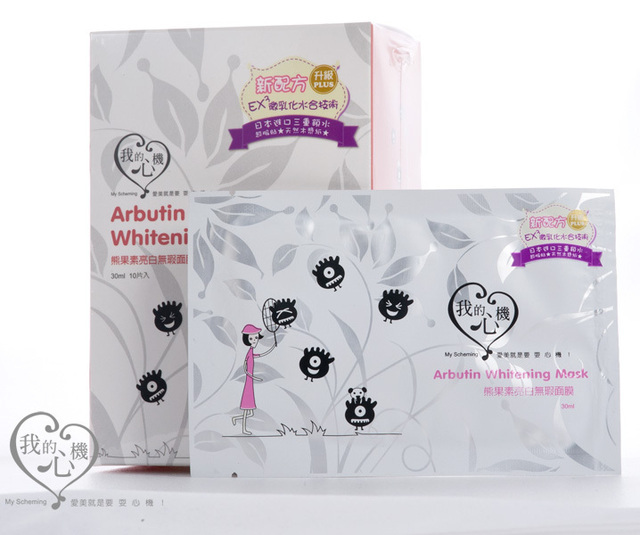 My Scheming's Arbutin Whitening sheet mask. My scheming is a brand is a Taiwanese brand, but can most likely be found in most Asian countries. There were rumors that MBD, or My Beauty Diary, and My Scheming are from the same company, but I'm sure they are not. Both brands carry very similar sheet, and silk masks, is all. I believe each country who carry MS sheet, or silk masks, has their own version of My Scheming that you can't find anywhere else, AND Watson's carries these masks. Watson's, from the best of my knowledge, is also just in Asia, and is comparable to our typical Walgreens, CVS, Rite Aide here in the US. Does your Watson's have them? Tell me in the comment section below if they do, so if and when I visit your country, I know there's somewhere I can go to for sheet masks. Thank you in advance! This contains, other than the main ingredient Arbutin, White Mulberry root, Rosa Canina or Dog-Rose, Gentian Root, and Gingko Biloba extracts, as well as plum ("common" plum to be exact) extracts. White Mulberry root extract is used for its brightening properties, which lightens dark spots and other skin discoloration. Dog-Rose has vitamin a, b, d, e, high in vitamin c, flavonoids and carotenoids (lycopene), used as an, antioxidant, astringent and anti-viral. Gentian root has anti-inflammatory and anti-bacterial (anti-acne) properties. Gingko biloba, not only used for memory, it's also used in anti-cellulite products; its a potent antioxidant, microcirculation-stimulating effect, protects skin from anti-inflammatory, its an anti-bacterial, and it helps increase skin moisture (whew, gingko biloba works hard). The common plum, which helps smooth and moisturize the skin. as well as one other ingredient that may cause your skin to break out or have irritations. I would like to note that I did not have skin irritations, nor did my skin break out in acne. The mask is a soft cotton sheet mask that 'should' fit the entire face. It had a, I think, a plastic layer that had to peeled off before applying it to my face, but the mask did fit. Almostperfectly, too. I'm not sure if you can tell, but that's a plastic film. A lot of people complain that these masks don't fit their faces, so maybe I have a weird shaped head, or face? Meh. It fits. I like that it had that 'film' of plastic, it helped pull the sheet mask apart. There is also a lot of serum. Like A LOT of essence. There isn't much of a scent, too. My Scheming claims that this sheet mask will help whiten your skin, including PIH, sun spots, and dull skin. When they say whiten, it just means lighten. This sheet mask will not make your face look like "I-need-a-tan" white. Just like how the koreans say "brightening", it's basically the same concept. It will help prevent inflamed skin, like pimples, that is about to say hi to the outside world. And like all sheet masks, this one,will moisturize your skin, as well. Turned it over, and this is the sheet mask. My Scheming's arbutin whitening mask certainly brightened my skin. Loved it so much I couldn't stop looking at my mirror! It also helped that my skin was just beginning to recover from a vitamin c serum that seemed to have "expired" (oxidized). It sped up the recovery! Buuuut then again, that is what a sheet mask does -- it gives you quick and instant, but necessarily permanent results. Anyway, my skin was brighter, glowing, and the inflammation had gone down signaficantly. I needed it, because the next day we had a small family barbecue to attend, and I didn't want to look too gruesome. More on why oxidezed vitamin C serums are gross, soon, so stay tuned! I recommend using these at night. At least, I like using sheet masks that way. I like to see if my skin transforms over night. Also, I just love this sheet mask! 5 out of 5! I got this sheet mask in a gift set with 24 masks, on amazon. Yes, the pretty pink box. Such cute packaging. Prices may vary for each website, but they're pretty much in close range. Usually around $11-15, but they could have a sale going on. Check those out. If the links, don't work send me an email or leave a comment below and I'll fix it, so you can go and enjoy your online shopping sooner. This post is part of the AB Link Party! Got any suggestion, questions, or requests? I agree with you on My Scheming mask being the bomb! I personally have tried their sheet masks before and I do agree that they gives your face an instant whitening effect. On top of that, they give so much essence! I know there are so many masks by My Scheming, but I'm taking it one at a time. Next, I want to try they silk masks! I love My Scheming masks, more so than MBD! Have you tried their silk masks yet? They're so incredibly thin, and I don't think those contain parabens (but I could be wrong). I don't think I have. Oh, my. I might go "hunting" for this. LoL!